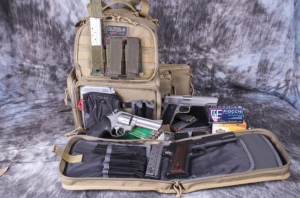 Being a Tactical-defense professional when we go for shooting at a range, we always search for an easy backpack where we can load our tools as guns and other ammo and carry them comfortably. So, the tough and strong GPS tactical range backpack is a real and trustworthy answer to our search for a smart tactical backpack. With its supreme quality, it is intelligently made which helps us to store and organize our gear in a smart approach as the storage has got the id facilities to quickly identify and set things right. This backpack is an eye-catching and efficient product. Its Teflon coating and tough material add to its durability. So, its strength, quality, and its stylish tactical attitude have made the GPS tactical range backpack a smart choice for everyone. Who Should Use The GPS Tactical Range Backpack? The title of the backpack has got the answer – “Tactical” and “Range”. This backpack is widely ranged from the tactical defense professionals to field users or one who does hunting. By reading this GPS tactical range backpack review, you will get to know the utility of this backpack. This Gun backpack is very useful for military personel as it has got the storage cases for the handgun and the storage of magazines. The GPS tactical range backpack is really tough and built very strong. This is made of 1000 denier which is the toughest and a durable heavy duty material. Also, the coating includes DuPont Teflon which adds up to the strength of the backpack. The size is 14x19x11 inches which is a suitable size for tactical use. The most remarkable feature of the backpack is that the storage system has got id tags which helps for the quick recognition of your own gear. The backpack has got 4 pockets on the outside with zips. These pockets are very helpful for carrying ammunition. The zips are lockable. The compartments are large enough to hold guns and ammo. The sideways hold the storage of three handguns, which makes it very comfortable. The gun compartment case size is 10.5×7.5 inches. 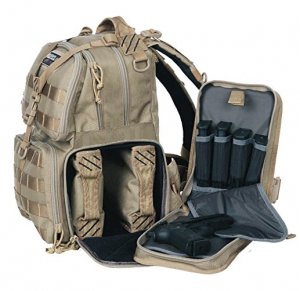 This GPS tactical range backpack tan is mainly praised for its systematic approach. As told earlier, the id of each storage space makes it very comfortable to find and identify your gear quickly and easily. This GPS tactical range backpack could help you in quick deployments where speed is essential. Ordinary backpacks are made by various companies, but this Gun backpack as its name suggests holds guns. Thus, the prime concern is the safety. This backpack has lockable zippers. 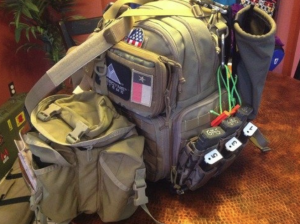 The GPS tactical range backpack has straps where other tools can be easily tied and attached. The remaining items can be easily hooked up. Well-spaced gun cases and proper storage of the ammo helps to hold them easily. Thus, the strong lockable zipper compartments and the Teflon coated untearable material make the GPS tactical range backpack tan very safe. The shoulders straps are really comfortable. The Teflon covering helps to carry the backpack in rough terrain if needed. What is the size and how many pistols can be stored? It is 11inch in length, 8 inches in breadth and 3 inches inside. Yes, the main compartment has lockable zippers. Can beretta fs 92 be placed in the case? Yes, this pistol can be placed in the backpack. What are the sizes of the gun cases in inches? The gun cases are ten and a half by seven and a half inches. Does the GPS tactical range backpack has water bladder? No dedicated bladder slot is given but the compartment is large enough to hold bottles. Do the straps have molle compatibility? The straps are with molle feature to add extra items. What is the backpack material made of? It has got 1000 denier and it is very tough material. Can the individual gun cases be locked? No, only the main compartment can be locked. Can an extra gun case be added? Although it weighs 7 pounds, it feels like a normal bag. Are the shoulder and waist straps comfortable? Though the padding are missing in the straps, the shoulder and waist straps are comfortable. Do pockets have identification feature? The pockets have ids, but few of them misses. Can it be used for hunting and tactical purpose? Yes, it is very useful for carrying tactical tools and hunting. Sometimes all the gold can be found in a small box. The same is true for the GPS tactical range backpack. The backpack has got a great combo of Style, Toughness, Durability and Organized approach. The backpack is a true gift for the defense and tactical professionals where they can place their important belongings. Its applauding features are the gun cases and the lockable zips. Its materialistic toughness is added with the 1000 denier material and the Teflon coating which makes it strong. Like the action movies, this GPS tactical range backpack also has got all the strong and smart features, which makes us bound to grab this backpack and start our action journey, especially going for shooting at a range. So, let’s be quick and grab this wonderful GPS tactical range backpack.